Good job Elvis had a great voice, cos he was slapped with the ugly stick! Wow! This is a hard one (said the actress to the bishop). How can you even try to condense Elvis into 20 minutes? I'm lost, so lost on this quest. Rigorous editing, and tough internal fights, have led me - reluctantly and with many regrets of lost songs - to this Elvis 20 minute set list. As I've said many times before, if I could have seen anyone live, it would be Elvis. 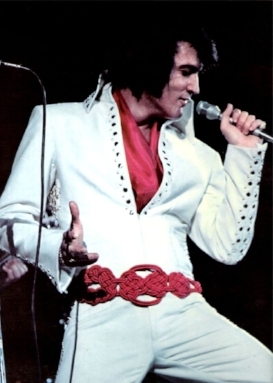 From the fanfare of The 2001 Theme to the end of 'Can't Help Falling in Love' an Elvis concert was a ritual; a carefully calibrated event to whip the audience into a frenzy. By 1968 he was a joke. A has been rock n roller starring in shite films. By 1970 he was back, power-housing his way through some of the best performances ever. Jump suit. scarves, big belts, new hits, old hits, 50 piece back up, fuzz tone bass and wah-wah pedals. The King was back! !